Getting married can be the most joyous event in a couple’s life. However, it can also be the most expensive. One of the major expenses can be the all-important wedding rings. These rings are symbols and commitment between two people who are deeply in love, and they will remain as a reminder of that commitment for (presumably) the rest of their lives. But, the thing is, these symbols do not derive their importance or worth from their price tag. If you cannot afford a huge diamond, it does not mean that the symbolism is diminished. Therefore, we are putting together a creative guide to finding creative, meaningful, and inexpensive wedding rings. The internet is chock full of ways to find the things you want at prices most would consider a steal. Overstock.com has a plethora of inexpensive wedding rings. They even let you shop by price range, metal, and a number of other categories that might be important to a couple planning a wedding on a budget. Another great resource is Etsy.com. This site is for the more creative and less traditional among us, but if you are not necessarily married to the idea of a traditional gold or silver diamond ring, Etsy is definitely the place to go for inexpensive wedding rings. Then, there are clearance sales in more traditional jewelry stores. The only caveat here is that this might be a bit more expensive than the aforementioned internet resources. However, they offer a more traditional shopping experience, with more traditional ring choices, if that is important to you. Kay Jewelers has an entire clearance section with many nice choices for rather inexpensive wedding rings. Make your own rings. Yes, this is done. Some people carve wooden rings with inscriptions that are special to them as a couple. There is no law saying a wedding ring has to be a diamond or any sort of traditional ring at all. In fact, you and your partner can make a romantic activity out of making your rings together if you and your partner are the crafty types. Forego rings altogether and do something meaningful to you and your partner as a couple, such as wallet cards with your vows engraved on them. Instead of metal rings, get wooden ones. There are many inexpensive wedding rings of the wooden variety, and they are beautiful. Go for a cheaper stone. There’s no reason the ring has to be a diamond. If you and your partner discuss it and agree, get something other than a diamond. This one can be pretty controversial, of course. It is also something both partners need to be completely on board with before it is even a consideration. After all, most brides-to-be want their very own, brand new ring on their special day. However, if both halves of the thrifty couple agree, buying inexpensive wedding rings of the used variety could be the way to go for sure. There are many places online where used rings can be found, such as Craig’s List, Ebay, and other online classifieds websites. Of course be sure that the site is reputable before proceeding with any purchase. Again, this may be the last resort for some and something that is out of the question for others, but it is definitely a way to save money. Alternatively, if you are willing to sacrifice the traditional shopping experience in brick and mortar jewelry stores, buying online can save you loads. Amazon and Groupon both have some inexpensive wedding rings. Now, no one is saying that anyone should get a ring with a diamond that is so small you can’t even see it, but going down just a little bit of a carat can save the thrifty ring shopper loads of cash. For instance, if you are looking for a 2-carat diamond, choose 1.95 carats instead. What is important, to make the diamond sparkle, is the cut, not the size. If it is absolutely essential for you and yours to have big, flashy rings to make your day the best it can be, there is absolutely nothing wrong with that. However, most people do not have thousands upon thousands of dollars just lying around to drop on rings. To that end, think of buying your wedding rings like buying a car. Unless the car is incredibly cheap, most people don’t buy it outright. They finance it. The same can be done with wedding rings. If inexpensive wedding rings are not in the cards for your special day, go to a brick and mortar jewelry store and ask what their options are for reasonable financing. It creates another monthly bill as you are just starting out, but it may be worth it to many happy couples. In the end, your wedding day is yours. Rings are an important part of the wedding tradition, and it is important the event is as close to perfect as possible. After all, it is supposed to be one of the happiest days of your life. It should be perfect. There are many rings that will make sure you get the answer you are looking for when you propose, and most of them don’t cost a small fortune, either. 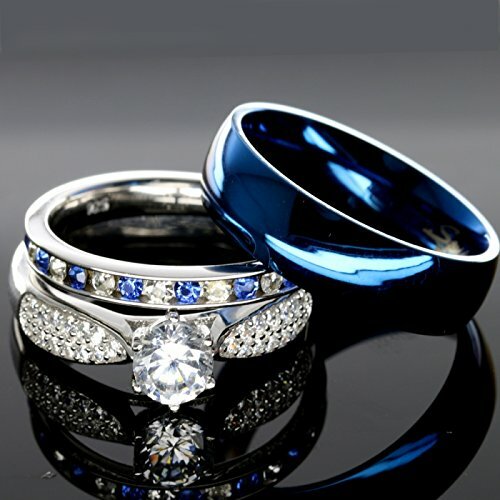 Inexpensive wedding rings can wow your partner, as well as high dollar ones, can if you take care while choosing them. In the end, the wedding and the wedding rings matter. However, do not forget the real reason you are doing all of this: You have found the person you want to spend the rest of your life with. That is something that is more precious than any wedding ring, any cake, any dress, any event venue, or any of the other things we put so much stock when it comes to a wedding in our culture. Just make sure to have fun, thank your guests with some amazing cards, and have the best life ever! Happy nuptials! Engagement ring features a 1.43 CT cubic zirconia stone accented by 13 stones on each side. Women's wedding band features 27 alternating blue and white stones.